Not just your regular grammar and spell checker, ProWritingAid is a powerful writing tool that corrects almost every aspect of your writing, grooms your style and helps you improve your writing over time. With the option of lifetime access, this is a must-have in your content arsenal. Looking for hands on ProWritingAid review? Do you ever read your final draft and feel it could be even better? If that’s an yes, don’t worry it happens with all of us. Heck, even writers like J.K. Rowling & Stephen King feel the same and leverage editors before publishing their final work. On a side note, you might be interested in my pocket guide to English grammar cheat sheet. This makes even more sense if you’re a blogger, author, freelance writer or copy editor because well-edited writing can boost your credibility, get you more sales or land you clients that pay you well. You can always use free grammar checkers like Grammarly (download free chrome extension or read my hands on Grammarly review) but today, we’ll be talking about another very promising online editing tool called ProWritingAid. In this ProWritingAid review, we’ll discover what is ProWritingAid, how it can help you write better and everything between the good, the bad and the ugly. Click here to read our final verdict & claim your 25% discount coupon on ProWritingAid. In short, Prowritingaid is the Swiss army knife for bloggers & writers that not only helps you with correct grammar & punctuation but also check for traces of duplicate content. ProWritingaid is not a replacement for human proofreaders but it does check & help you write error-free content. ProWritingAid is an online writing tool that checks your spelling and grammar mistakes, provides style corrections, reports you about repeated words & clichés to name a few. At the first glance, ProWritingAid seems like a specialized editing tool for authors and writers but after using it for sometime, I knew why it is trusted by over 700,000 users which include authors, editors, freelance writers, professional bloggers and students alike. ProWritingAid claims to be your grammar guru, style editor and writing mentor all in one package. It’s like getting a personal writing coach! But how well does it perform? How does ProWritingAid score against it’s well-known competitors like WhiteSmoke or Grammarly for that matter? To get you a hands-on review, I used ProWritingAid and here’s what I found. You can also get a ProWritingAid 15 day free trial from here. What Platforms Does ProWritingAid Support? So, that means you can use it as a standalone software on your Windows or MacBook, else as a plugin or add-on for Microsoft Word, Google Chrome or Google Docs. If you are thinking about Android, nope. Android integration is not yet available. Lastly, even using none of these plugins, you can utilize their online editor on their website. Now, the user-interface and functionalities differ depending on what platform are you using it on. I will discuss them later. User Interface and performance are two important factors that come into play even before you test the working ability or accuracy of any software. It is the first impression that helps you decide whether you will stick around a tool or software for a longer period or not. ProWritingAid provides different user-interfaces based on which platform you are using it. I tested with a doc file containing text of around 1100 words, and after uploading, it took like 2 seconds to display the text it contained. That’s fast enough. :). Soon after that, it automatically identified the issues with the content and highlighted in red, yellow and blue. The color coding is important. Suggestions with a yellow color underline improves readability, the blue ones correct spelling mistakes and more spelling related issues like hyphens or apostrophes, and the red ones are for unknown words that ProWritingAid thinks as new words and offers you two options: either to correct it to some suggested similar words or just add it to dictionary (for names etc.). Hovering your mouse over the underlined words loads an on-screen popup with the suggested changes. I’ll talk about the accuracy and testing part of the grammatical mistakes later on. Let’s talk about user-interface here. You’ll be amazed with the number of options it offers you. The menu bar is filled with common yet deadly grammar mistake-correctors like , sticky sentences, dialogues and more. I love the fast response of the software while I am using it. It detects the mistakes as soon as you throw it some piece of content. The interface is simple, and without heavy coding that could slow you down. But as a result, the overall UI what you get is a bit old-school. But I have no complaints as long as it is doing its job. And moreover, the simplicity makes your work quicker. Okay, moving on to its windows native client, installing the software was easy, thanks to the easy-to-understand installer. Soon after you launch it for the first time, it will ask you to enter your email ID and password. The user interface is slightly better here though it comprises the same menus. But there is one major difference: It does not have the real-time analysis, unlike the web editor. This above picture is from the web editor where it shows you the issues as soon as you upload any content. But the software doesn’t do that. Surprising, isn’t it? For most users including myself, real-time analysis matters a lot, as it helps a user to correct their mistakes quicker. The Microsoft Word Add-in for ProWritingAid is completely different, and after you install it, you can locate it under the add-ins section of Word. It looks something like this. The first time you try to do any check, it will ask for your ProWritingAid license code, enter it over there. Performance wise, this Word Add-in is a lot faster than the traditional ProWritingAid editors. I was getting suggestions real quick. Also, just a double click and it will change the word to its suggested word for you. 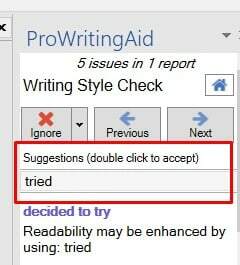 If you’re looking for a grammar checker for Google docs, it has to be ProWritingAid. 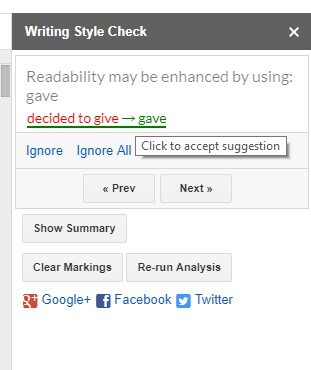 Even Grammarly doesn’t have a grammar checker or editing option directly on Google Docs. So if you’re someone like me who nearly spends half of his day using Google docs, you should definitely give this a try. The Google Docs Extension is a similar version of the Word Add-in. But, with a better user interface. The performance is also fast enough. The only thing you need to note down here is that the Google Doc extension only works with the email you used to register with ProWritingAid. If you try to use it on any different Google Drive, it won’t work. Fair enough. ProWritingAid Google Chrome Extension comes handy whenever you are writing something on a text field. It will offer you to correct your errors in any text fields. A ProWritingAid icon is generated at the bottom right corner of any text field. As soon as you hover your mouse on it, it will show you the menus. Unfortunately, it does not work as smooth as the other platforms and many times it doesn’t detect text at all. And copy-pasting is a hassling job. Also, I faced this weird issue of a self-increasing text field when I tried to post something on Facebook. With every second, the text field was increasing automatically, and the ‘Post’ button was going down. This was gone when I removed the chrome extension, which confirmed that it was triggered by that extension only. Sad! ProWritingAid MacOS Software is exactly the same as its Windows counterpart. Nothing special to write about it. Okay, so now as we discussed the user-interface and performance of ProWritingAid, let’s move on to the features it offers. To be honest, this is a long-list and I was happy that ProWritingAid provides some features that is missing from other popular options. This is how it checks, polishes & improves your content. Summary: If you always wanted overall information about your writing style in one place, the summary option will do the job for you. It collects a lot of statistics about your content. Which is great if you want to send a content report along with your content. Document Scores: It checks your document and gives you a score based on your spelling mistakes, grammatical mistakes, sentence styling, etc. And based on all of these, it gives you an overall score. Document Statistics: ProWritingAid gives you a statistical data about your word count, number of sentences and paragraphs, no of characters with spaces and no of characters without spaces. The word count and sentence count especially is very helpful. Vocabulary: Gives you an idea of the words you used to write your content, whether they are common words or unique words. Also, it lists your most used words and most unusual words. Readability Measures: It compares your content with the readability scales used globally and assigns you the scores accordingly. Most importantly it aims to give you an idea of how easy to read is your document for any user. Very crucial if you write blog content or long-form content. Overused Words: Points out overused words and not overused words. It helps you avoid jargon in your writing. Sentence Structure and Sentence Length: Gives an idea of your sentence length and variety. It also shows a graphical representation of sentence lengths. Writing Style: Points out the writing style issues and shows you suitable suggestions for the same. Grammar and Spelling: This is probably the first thing you would want ProWritingAid to do, that is, to check for grammatical errors and spelling mistakes. Sticky Sentences: This is an important and unique tool for everyone. It finds out if you have used glue words (most common words) excessively which increases the sentence length and offers you suggestions to make it shorter. Dialog Tags: Another unique thing with ProWritingAid. It comes into play when you are writing a story involving direct speeches. It takes care of that and makes sure you don’t distract the reader with adverbs for describing what’s happening. If you can’t understand, read about Dialog Tags here. Pacing: This also comes into play when you are writing a story with several chapters of content. It finds out the areas where the story pace is slow and might become boring for the reader to go through. This is also a unique feature of ProWritingAid. Transitions: Another unique feature of ProWritingAid, it finds out the transition words that link your writing together. For example, words like overall, quickly, as soon as, for example, etc. Repeated Phrases: Gives you the list of phrases you have used repeatedly and the number of times. It helps a lot in creating variable sentence structures and making the content more creative. Clichés & Redundancies: It helps you to find out clichés and redundancies from your content. Clichés are stereotype words that are overused by every common writer in their content. Redundancies are unnecessary words in your sentences; omitting them won’t hurt the meaning in any way, moreover, make the sentence more readable. Consistency: This is another extremely useful feature exclusive to ProWritingAid. It checks for different spellings or capitalization or hyphenation of the same word in multiple occurrences of your content. Thesaurus Check: This comes extremely handy when you are in search of a replacement for some specific word. It searches for synonyms for nouns, verbs, adjectives, and adverbs. Acronym Check: It checks for acronyms in your content. It will also find out if you have used different cases for acronyms. Homonym Check: Homonyms are words that sound alike but have different spellings and of course, different meanings (like tea and tee). This check will search for homonyms. This isn’t much required for your everyday grammar check, but having that feature is good. Plagiarism Check: It compares your written sentences to that of published articles online and finds out the sentences that may be plagiarized (or may seem plagiarized). This helps a lot if you are hiring some writer to write your content and want to check the authenticity of the submitted content. How Can ProWritingAid Help You? In a world where more and more writers are relying on editing and proofreading tools, ProWritingAid is a must-have in your content arsenal. ProWritingAid is the only manuscript editing software that generates over 20+ reports on your writing (based on style, contextual spelling mistakes etc) and tracks your performance over time so that you can learn and improve your writing. The number of dimensions ProWritingAid app checks your writing for (mentioned above) is more than enough to help you spot writing errors, correct them (with the suggestions you get) and improve your writing effortlessly. Another important feature is, ProWritingAid is the only online writing & editing software that supports almost all platforms. It’s my go to grammar & punctuation checker tool for Google docs (& scrivener, if you use it). The readability reports (along with Flesch Reading Score & statistical analysis) gives you an idea of how your writing quality is performing over time. ProWritingAid is a great writing editor and proofreader for fiction writers & authors in general. It has a resource library of 10,000 books that feeds it’s algorithm to understand fiction prose and give suggestions to improve.However, if you’re an author and want to have even better and crispier suggestions to groom your writing, you can first feed ProWritingAid with books of the specific genre you’re writing and then calibrate your writing based on tho scores those books get. After you get an idea about what scores those books get (remember those books are edited by highly professional editors who know their stuff) you can calibrate your writing based on those scores without having to worry about what PWA suggests. I’ve noticed ProWritingAid quietly missed some comma suggestions (although it was quick to point out unmatched quotes) which could be because the style guide it follows. You can quickly overcome this by using these free comma splice checkers online. Just edit and polish your copy with ProWritingAid and then fire a comma checker from above list and check your writing one last time for correct comma placements. If you face lag issues just because you uploaded your whole 400-page script in it, I suggest uploading it chapter wise so you can focus on editing without facing freezes or lags. ProWritingAid Pricing Review: Is ProWritingAid Worth The Price? ProWritingAid offers a free plan that gives you a summary of your writing errors and checks for 19 different flaws in your writing. However, you can use it online only with 500 words at a time to check. ProWritingAid also offers a lifetime discount that comes with a price tag of $285 which is something that none of ProWritingAid’s competitors’ offer. Want icing on the cake? Let’s talk about ProWritingAid discount coupon. We’ve officially partnered with ProWritingAid to offer you an exclusive ProWritingAid discount coupon of 25%. Click the button below to claim your discount and don’t forget to add the coupon code “GYD1925” (without the quotes). ProWritingAid offers you customer service via email and support tickets which works decent is more than enough for a normal user. While all other ProWritingAid alternatives do not create a significance difference, Grammarly gives ProWritingAid a tough run for its money. Grammarly’s user interface is much better than ProWritingAid’s and supports almost every platform (except Google docs which it will launch soon). ProWritingAid’s free version is a bit restrictive and doesn’t support all platforms while Grammarly’s free version corrects most of your mistakes, sits on your browser and corrects all every single mistake no matter what platform you’re writing on (social media, emails, blog posts etc). The premium version of ProWritingAid doesn’t include plagiarism checker (you’ve to pay a little extra to access it) unlike Grammarly that has a single payment option including unlimited plagiarism checks. 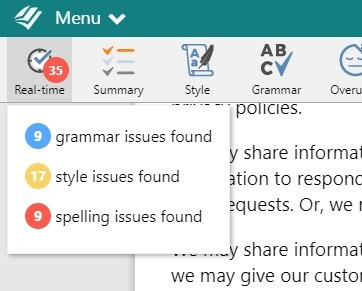 While Grammarly does have a style editor that edits your copy based on the genre of content you’re writing on it (which works fab for most of us), I personally felt ProWritingAid’s writing reports are better & second to none as far as editing manuscripts or books is concerned. If you’re a writer or author or a book editor, ProWritingAid is better than Grammarly in my honest opinion. Having said that, ProWritingAid has a fantastic lifetime access plan which is crazy cheap if you ask me. The difference between ProWritingAid to that of Grammarly isn’t much except the chrome extension (which is free for Grammarly). ProWritingAid is highly recommended for writers, authors or books/novel editors. It simply overpowers Grammarly with the options it provides to polish your fiction. Don’t forget it has support for Scrivener & Google docs which is a deal maker for me. It offers all sorts of possible grammatical and vocabulary correction options that you might need. With the style suggestions, overall writing reports, and tips to improve based on your past writing scores, ProWritingAid is like having a live personal writing coach for yourself. The ProWritingAid engine is updated with the latest English vocabulary, and the accuracy of the tools it offers is spot-on. Available for all platforms including Scrivener, Windows and Mac native software, Word add-ins, Google Docs and Google Chrome plugins and an online editor. Overall interface is lightweight, fast and easy to use. Lifetime deal which is a deal maker if you’re in the writing biz (because recurring payments are actually much more costlier in the long run). Sometimes lags when you throw vast books or documents (like 500 pages at once) to edit. My Verdict: Is ProWritingAid Worth it? Yes, ProWritingAid is definitely worth your investment. It detects, critiques and gives extensive suggestions to improve your writing which is more than most of it’s competitors. With the pricing structure (with a lifetime access option), the number of writing reports it generates and the platforms it supports (Google docs, Scrivener etc), ProWritingAid is worth it. It is the best online writing & editing tool for the price it comes with. If you ever wanted to have your own writing coach, ProWritingAid makes it possible only for a whole lot less. ProWritingAid offers a bunch of editing tools at fingertips for your convenience. I was surprised by seeing how much you can improve your text with this tool. Among the various features offered, I liked some features such as sticky sentences and glue index, repeated phrases, thesaurus, clichés, and redundancies, etc. as they pointed out the areas which can be improved and make your content more readable & engaging. If you’re looking to improve and better your writing in the long run rather than just getting spelling and grammar checks, ProWritingAid is a must have. Best comma splice checkers & best online proofreader software.